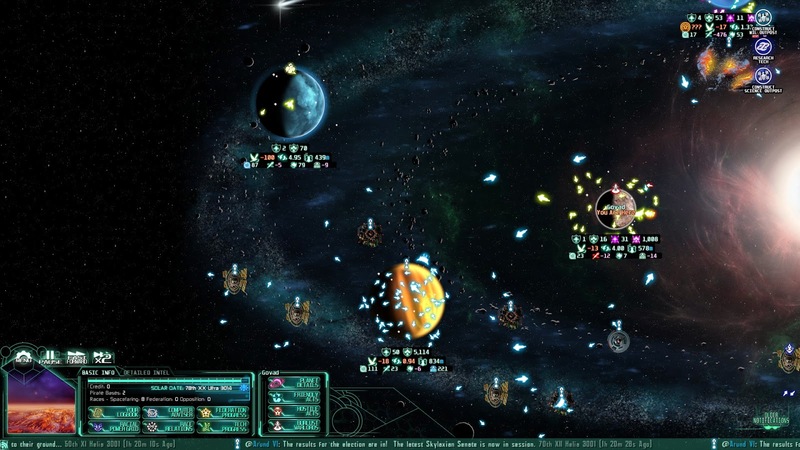 The Last Federation marks a return to the space strategy genre for Arcen Games. As the last remaining member of your species, a fugitive in a stolen flagship, you must work with and against the other species in the solar system to unite them in a federation. It's a complex concept that requires equally complex gameplay. Arcen has a history of deep gameplay, and their latest game takes full advantage of that experience. 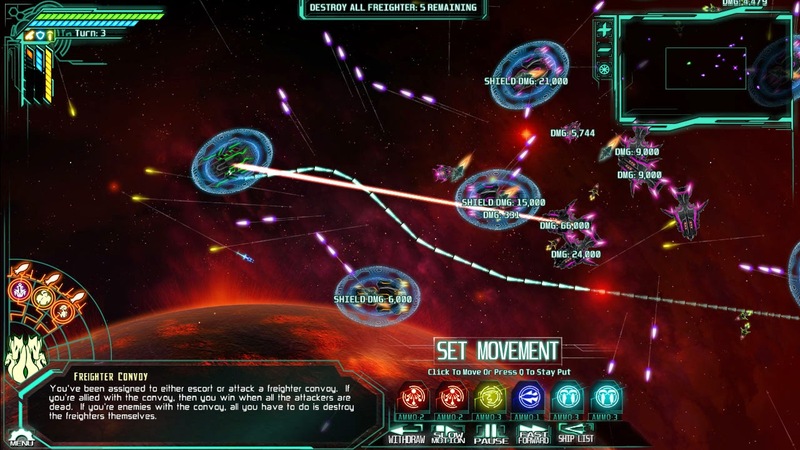 On the surface, the initial gameplay feels fairly simple. But after traversing the first few missions and combat scenarios, the game explodes with options. Up to five factions are present in the solar system at any one time. Not all of them are immediately spacefaring races. Your eventual goal is to ally yourself with the other species in the system. Getting there is the really difficult part. You are the last of the Hydral. Your species was the first spacefaring culture in the system, and for a long time, the only. Every other manned mission attempted by another race was destroyed by the Hydral command, who saw themselves as the only species fit to rule the stars. You sought to change that, but your mission of peace was disrupted by a sudden and cataclysmic attack on your home world by the other races in the system. You escaped the destruction of your planet but were apprehended after crash landing on another world. After many years in captivity, you broke free and stole a powerful flagship that now serves as your central command. Since your species was responsible for centuries of space based oppression, they aren't too keen on trusting you. You have to find ways to improve your relationships with the other cultures in order to secure your future. Sometimes that means helping them out, but a lot of the time it means screwing over one race to help out another. There is no high road to play in The Last Federation. You have to take some pretty seedy measures to get what you need. I found myself stealing tech from whoever I could in order to gain some favor with a couple other races, raiding pirate bases occasionally, and buying help from mercs on the black market. Your goals may be noble, but the means used to get there are anything but. Think Civ V meets House of Cards. They all have one thing in common. They hate your guts. There are two primary screens in The Last Federation. First is the strategy screen, where you can see the status of the other cultures in the system. At a glace, it seems like a lot to take in, but a couple hours of navigation and you'll be able to read it quickly. From here you can travel from world to world, advance your tech tree, undertake assignments, negotiate with other races, initiate combat, customize your ship, assign subterfuge missions to operatives, and a number of other things. Like I said, there's a lot to take in. Luckily, the game trickles these elements in piece by piece to keep you from getting overwhelmed. That's a good thing, since the most important decisions you'll make in the game happen here. This is nothing. Wait until you're dodging a dozen ICBMs in the middle of all this. The second screen is the combat screen. This is where a number of the missions you undertake will play out. The combat is turn based and ranges from ludicrously easy to sadistically difficult. You have three weapons at your disposal at any given time. but some enemies are resistant to particular weapon types. You can tweak the power distribution to your engines, shields and weapons, but decreasing the power to something comes with loss of potency; weapon range will drop, shield strength will slacken, engines won't get you as far. It's a constant balancing act, all while trying to navigate hundreds of incoming weapons fire from dozens of enemy ships. This is all just the part that you directly control. 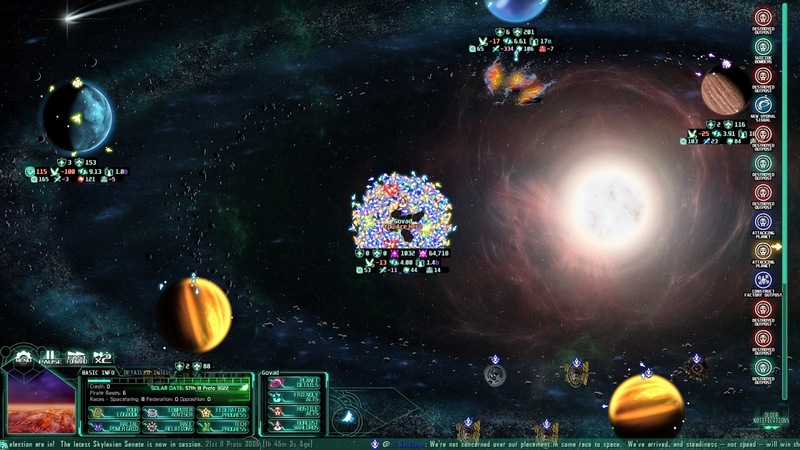 Behind the gameplay mechanics is a living solar system. The entire campaign is built on top of a complex simulation. Your actions have very real influence on the simulation, but should you decide to sit back, things will happen without you. Alliances will be made, wars fought, planets bombarded or invaded and the might of the other races will rise and fall. It's really interesting to just sit back and watch. Arcen was nice enough to include an observer mode that lets you sit back and watch things unfold without interference. I broke the game watching observer mode. Every civilization converged on one planet, thousands of ships, swarming and bombarding it. It was really incredible to see every ship each species built sent to the same planet in a centuries long shootout. While they focused everything on the one planet, piracy grew among the asteroid belt, destroying facilities and looting planets. Eventually they united under the flag of a single captain. There were tons of pirate ships flying through the system as they pleased. Eventually there were so many ships on the planet and in the asteroid belt that the whole thing seized up. There is a planet in there somewhere, I think. The Last Federation is a triumph. It's an epic scale strategy game that puts the player is a seriously deperate situation. It forces the average strategy gamer out of their comfort zone by stacking the odds so squarely against you. 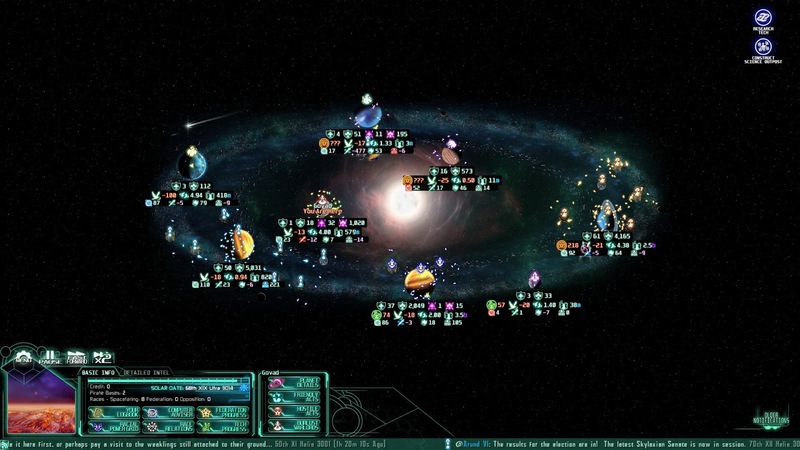 Where most strategy games ask you to consider your actions from one or two perspectives, The Last Federation requires you to consider the ripples from even the smallest action. Everything has a meaning and a consequence. What will you sacrifice for the greater good?